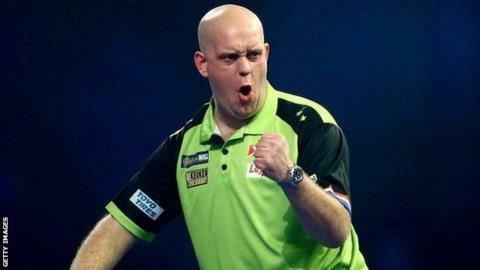 Michael van Gerwen kept the defence of his Premier League darts title on track by beating Rob Cross 7-2 in Dublin. The PDC world champion is top of the table having won all three of his matches - the only player to do so. Elsewhere, Gerwyn Price's match with James Wade and Mensur Suljovic against Raymond van Barneveld ended in draws. Peter Wright picked up his first win of the campaign with victory over Steve Lennon, but Michael Smith remains winless after losing to Daryl Gurney. He is not the only player yet to taste victory in 2019, as both Suljovic and van Barneveld have drawn twice and lost once. There have been no such problems for Van Gerwen though. He dominated Cross, racing into a 6-0 lead before twice missing the opportunity to complete a whitewash. Van Barneveld and Suljovic shared a seesaw encounter, as the former rallied from 4-1 down by winning four straight legs - ultimately though, he had to win the final leg to secure a point. The draw between Price and Wade followed a similar theme, while backed by a home crowd, Ireland's Lennon - the third of nine Premier League replacements for the injured Gary Anderson - pushed Wright hard, but could not pull off an upset. Smith was overcome by Gurney, who roared back impressively by winning the final four legs of their contest. The Premier League heads to Exeter next, where Luke Humphries will stand in for Anderson as the guest player.